Background: Simple topic this time, no strings attached. If you're unsure what the words mean use a dictionary or wikipedia or any tool of your liking, interpret as you like. It's wide open. 1. 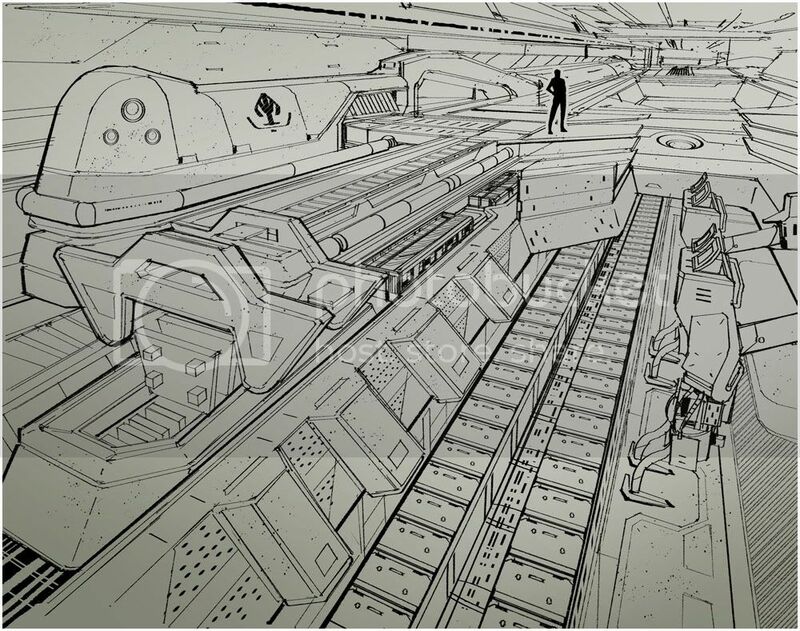 Design and draw a Crawler Factory! cool, this is more like an environment, ain't it? thanks for setting that straight, guys! Hideyoshi: Hm I think I misunderstood you first time around. With 'crawler factory' I mean a huge factory that's moving around with the factory within it's bulk, much like the Spice Sand Crawlers from Dune. A quick search on the internet showed me that it can also mean the space within the factory, where the products are moved around on conveyor belts and stuff. I mean the first one, while I think yours is the latter (since that does indeed fit more into EOW)? I think this should clear things up. This is a crawler by today's technology, it is basically a crawler transporter a platform on tracks basically. It was used to move the space shuttle discovery. If you look up to the top right corner its the factory that made it. What hideyoshi was making, a box the poops tanks. It doesn't always have to be on tracks though here's what I thought when I first saw the crawler bit, yes a first generation crawler-from nature. Techy crawler. I say techy its lego. Couldn't quite grasp the term so I didn't consider it could be a factory on tracks. Hm... I could come up with something new, maybe. Hideyoshi: Actually, it's probably my bad too since I actually said "interpret as you wish". I don't think I'd really ban it from poll if your design fits the brief one way or the other Still, it's not EOW in here so just keep that in mind. WIP. My first IDW. I'm haveing real troubles doing this weeks CHOW so i'm gonna have a crack at IDW - nice topic. Seems a bit too flimsy, by god, a good shot at one of those legs would have it drop to the ground like a dunken londoner. I've had a good look and i can't seem to find a ladder. What if someone needs a pee? I think the vertical perspective is a bit over the top in real life it'd be placed a long way below what your doing, for something this size I think the dpace between left and right vanishing points should be the same as the vertical vanisher to the horizonal. hope you can follow that. Thanks Dark Eagle, I hadn't thought about a ladder. I'm working on a much more detailed version atm, which will make more sense. decided to stick with the perspesctive as it isn't so real as it is meant to look ridiculous. The ladder is an extendable one from the box in the gab in the rails. I will make that more obvious. Just got to colour now. hopefully I will get time to continue with this one. my lack of participation has been sad. but I keep an eye all the time. I have decided to do an underwater crawling factory for crab/lobster fishing and processing. Is it the most exciting concept ever .... no. But it could provide a whole season of interesting new material for discovery channels 'deadliest catch' show. evamonkey- I think its a great idea. Jeff, I think I saw another of your posts somewhere (maybe another IDW) with this type of idea skectching. its a path I had never taken and thought I would try it. Its a meek shot in comparison but its a start. I like your layouts and I like how they differ quite a bit. Dragonspit for the initial side view, "visual brainstorming" keep away from the grays to keep it neat tidy and easier to take forward into rendering if your going to render the side view that is, even if your not I think having to many grays is awkward at the start. here is my entry. Fully automated droid factory. I shouldn't have been doing this. I have so many lesson plans to write, but i still spent several hours playing round with it. such a muppet. Not totally happy with it, but have already spent too long on it, so thought I'd throw it into the mix anyhow. Enjoy. Jeff - Those designs are killer. Any one of them would look suh-weeeeeet in a 3d sketch. I can't wait to see which one you pick or combine. I might do this one but I've got a lot on my plate. I think mine will probably be a day or so late. I kind of became obcessed with the idea the more i sketched it, trying to work it all out correctly in terms of function. I'm block modelling loosely with an eye to two paintovers and a starwars style cross - section paint over. The reason i do idw is because the topics make me think in interesting directions, so while i would have loved to have had it done in time, im probably going to staple it to the voting topic a day or two after the fact. I forsee the cross section paint over to be a monsterous task given the several deck thickness, but i think it will be worth it. I'll try to finish this in time, just a walking forest eater, transforming acres and acres into an energy source, stored in the midships belly, that it either hops offworld with or walks to the nearest population center with. I'm liking Jim Hatama's fat fat bug of a factory! Quick and confident. Here's a line art. I want to at least put some gray shade on it but suddenly I have a million things to do so I'm gonna have to leave it here for the moment. I like all the ideas here, this stuff all looks cool! video pulled already, damn that was fast. 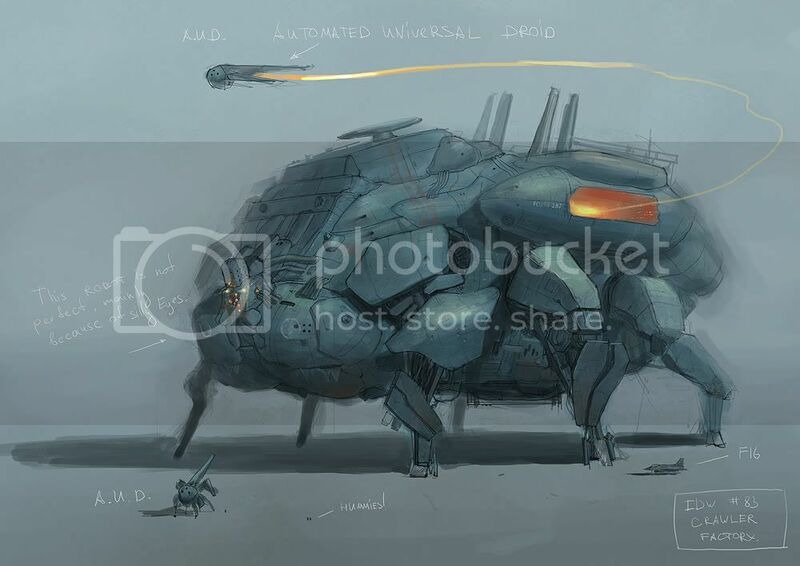 Designs look cool, bot have huge sense of scale. scary detail in yours jeff. Thats a link to their website video demo. This is my entry for the 'crawler factory'. The fifth device of IncuBus. As the name itself renders,This giant mechanical leech moves at a slow pace. It recruits workers...men ,women ...and sends them to the inbuilt Furnace. The women are kept as 'stock reproducers' for additional manpower in the future. The offsprings generated are categorized into 3. Workers,Fighters ad Stock reproducers ( female child). Nobody knows clearly as to why the workers are recruited or 'what' they do inside.But rumors are that they forge weapons-of all types, for an imminent civil war.A war thet will last for ages...where the necessity will only be there for a fighter and a weapon. The fungi colony breeded on the shell of the recruiter provideS limitless bio energy for the forge and the furnace. What happens to them.nobody knows!!! Hello, here is a sand-crawler-factory. The factory is thought to operate in the area of desert, it means it can encounter sand storms that can cause electrical because of the sand composition. The factory is well sealed to prevent infiltrations of sand inside. The factory dispose of apartments for workers, the dining room, helicopter-airplane runway, conference hall, etc. Last edited by Mutley; November 8th, 2008 at 03:26 PM. For those people that are worried about the deadline, I'll leave this round open until about 30 hours from now so see if you can squeeze it in before that time.